How do I buy? What should in know first? First of all, LDDb.com is a marketplace and not a shop owned by a single individual. eBay.com is also working on this model, they do not sell anything physical but rather provide the service to make buyers and sellers agree on a transaction. This is what I intend to do too with a more crafted approach focusing on Laserdiscs, and more effective tools and pricing history to provide anyone with fair and free information on past transactions. Second, although the Feedback number is a useful information to evaluate a Seller/Buyer profile, I cannot guarantee the seriousness of every Shops here. I can only create good conditions for a flawless transaction but payment methods, conditions and timing are up to both Seller and Buyer. I will of course collect claims and terminate accounts in case of major problems. On each LD list, you will be able to click on to get this symbol next to titles available in shops. On each LD Display page, the Shop availability is clearly stated (none, one or more). Your Wishlist (kept strictly anonymous) is very useful for both buying and selling. From a Seller point of view, when you input a title in your wishlist, it will be added to the wishlist ranking of this title (refreshed daily) and help building the list of the most wanted titles. Condition: the minimum condition (from 1 to 10) required to trigger a notification. Any LD avaible with a condition below this value will be ignored. Leave this information empty to indicate any condition. Price: the maximum price (in US$) at which you are interested in buying this LD. Any LD avaible with a price above this value will be ignored. Leave this information empty to indicate any price. Both Condition and Price: both values will be used to trigger an Email Notification. Additionally, when you set a maximum price and set the Notification to YES, this is considered a virtual Bid and will be used to give Sellers an evaluation of the current bid price. If you don't want to see your max price values used to calculate this "best bid", do not check the Notification box. However, Email Notification will then be turned off. Note that there is absolutely no obligation to buy at the price you set: it's only a good information for Sellers that might make them sell a title they would otherwise have kept. Please note that you will be forbidden from buying anything if your Account is currently frozen or invalid. All Users account should be kept up-to-date and provide honest and accurate information. The rest of the buying process is quite standard. When you find a title you are willing to buy at the price decided by the Seller, visit the shop, add this LD (or several LDs) to your Shopping Cart and proceed to Checkout when you are done. Before the final confirmation, titles current availability will be double-checked (Shops are dynamic, somebody might have already purchased seconds before one of the titles you currently have in your Shopping Cart) and you will be able to provide additional notes for the Seller. After the final confirmation, both you and the Seller(s) will receive Transaction Notification Email and it will be up to both of you to finish this transaction privately. Insufficient, could or did damage the LD(s), shipment fees were overquoted, etc. Above average, for double-boxing, extra-care for corners and spines, etc. The Seller will then get a +1/0/-1 mark, depending on your Feedback, but also a "Description Evaluation" and a "Packing Evaluation" to let other Buyers know what to expect in the future. How does the basic "Best Offers" work for the Buyer exactly? The point of a Best Offer is to bring more balance in prices offered and requested than the "best bid" mechanism used with the wishlists. How does the new "Counter Offers" system work exactly? Based on users (both buying and selling) feedback, I decided that the Best Offers needed to reach a new level of flexibility and here is the version 2.0. 48h are sometimes too short for a Seller to catch a best offer and validate it. On the diagram: New best offer -> [Pending] -> [Expired Seller] -> [Counter Seller] -> Buyer's decision to accept or reject. There was no automated way to signal to a potential buyer that his/her best offer was too low (most -50% gets rejected) other than reject/expire. 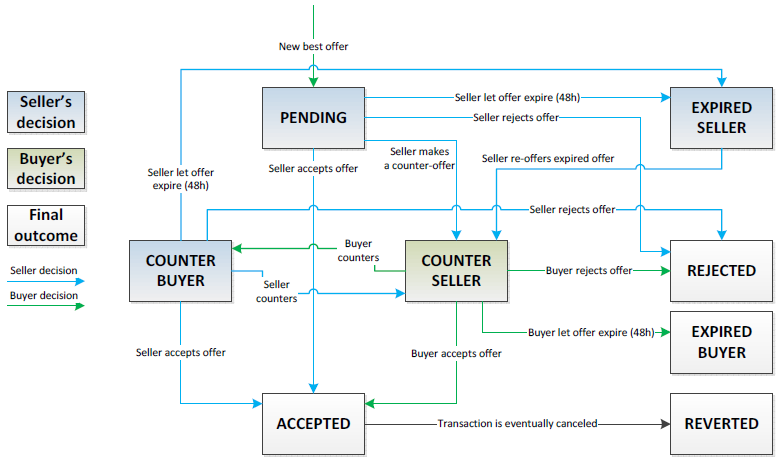 On the diagram: New best offer -> [Pending] -> [Counter Seller] -> Buyer's decision to accept, counter-offer or reject. If the Seller can counter-offer, so should the Buyer to keep things fair and try to converge towards a agreeable price for both sides. On the diagram: New best offer -> [Pending] -> [Counter Seller] -> [Counter Buyer] -> Seller's decision to accept, counter-offer or reject. The rest of the best offer process remains exactly the same: accepted/rejected offer (on either side) will trigger a standard transaction.